The sonar waves “veer” rather like a car veers when it encounters mud at the side of the road. The mud slows down the wheels on the left, so the car pulls to the left. You steer a tank to the left in a similar fashion, by slowing down the track on the left. See Wikipedia and you can read that the speed of sound “is conventionally represented by c, from the Latin celeritas”. Celeritas means swiftness or speed, which varies according to the properties of the medium. The speed of sound in sea water is circa 1500 m/s or 3,355 mph. In steel it’s circa 6000 m/s or 13,421 mph. In diamond it’s circa 12,000 m/s or 26,843 mph. It’s similar for seismic waves. Wikipedia says the propagation velocity depends on the density and elasticity of the medium, and is up to 13 km/s in the deep mantle. That’s 13,000 m/s or 29,080 mph. Of course in seismology we have P-waves and S-waves. The former are “primary” longitudinal waves like sound waves. The latter are “secondary” transverse waves like light waves. The equation for the speed of a transverse seismic wave is given as csolid,s = √(G/ρ), where G is the shear modulus and ρ (rho) is the density. The equation for the speed of light in the vacuum of space is given as c = 1/√(ε0μ0) where ε0 is vacuum permittivity and μ0 is vacuum permeability. There’s a reciprocal because permittivity is a “how easy” measure rather than a “how hard” measure. Other than that, the equation takes the same general form, and the speed of light in space, in “vacuo”, is said to be 299,792,458 m/s or 670,616,629 mph. Note that the speed of sound in air varies, the speed of sound in water varies, and the speed of seismic waves in rock varies. But it is said that the speed of light in space does not vary. Search the internet and you can find lots of articles saying this. See for example Luke Mastin’s article on the speed of light and the principle of relativity. He talks about the Michelson-Morley experiment, which “unexpectedly demonstrated that light travels at the same speed regardless of whether it was measured in the direction of the Earth’s motion or at right angles to it”. Mastin also says when light moves from one medium to another, its speed “can of course change depending on the new medium’s index of refraction, and this “bending” of light is essentially how lenses work”. However he doesn’t mention gravitational lensing. Instead he says regardless of the speed of a light source and regardless of your speed, the “light still travels at a steady 300,000 km/s, completely contrary to classical physics and common sense”. He also says it was the young Einstein’s genius to explain why. And that in 1905, Einstein realized that “the whole idea of aether as a medium for light to travel in was totally unnecessary”. It sounds good. Especially since “the constant speed of light was to become one of the two main planks of his Special Theory of Relativity”. Unfortunately there’s a problem. A big problem. How big? The size of Texas. And when does an optical clock go slower? See the interview with David Wineland of NIST: “if one clock in one lab is 30cm higher than the clock in the other lab, we can see the difference in the rates they run at”. An optical clock goes slower when it’s lower. This is said to be the hard scientific evidence for gravitational time dilation. But it’s really the hard scientific evidence for light goes slower when it’s lower. Yes, Einstein said the speed of light is constant in 1905 when he was doing special relativity, but by 1907 he was broadening his horizons and looking into what would become general relativity. That’s when he wrote a paper on the relativity principle and the conclusions drawn from it. He used Φ (phi) to denote gravitational potential, and he said this: “These equations too have the same form as the corresponding equations of the nonaccelerated or gravitation-free space; however, c is here replaced by the value c[1 + γξ/c²] = c[1 + Φ/c²]. From this it follows that those light rays that do not propagate along the ξ-axis are bent by the gravitational field”. Only two years after his special relativity postulate, there’s Einstein talking about a speed of light that varies with gravitational potential. This wasn’t some one-off. He said the same thing in 1911. That’s when he wrote a paper on the influence of gravity on the propagation of light. He said this: “If c₀ denotes the velocity of light at the coordinate origin, then the velocity of light c at a point with a gravitation potential Φ will be given by the relation c = c₀(1 + Φ/c²). The principle of the constancy of the velocity of light does not hold in this theory in the formulation in which it is normally used as the basis of the ordinary theory of relativity”. He said the principle of the constancy of the velocity of light does not hold. And it’s clear from the context that the word velocity is as per “high velocity bullet”. It’s the common usage as opposed to the vector quantity. Einstein was talking about the speed of light, which is why he was referring to c.
1912: “On the other hand I am of the view that the principle of the constancy of the velocity of light can be maintained only insofar as one restricts oneself to spatio-temporal regions of constant gravitational potential”. 1913: “I arrived at the result that the velocity of light is not to be regarded as independent of the gravitational potential. Thus the principle of the constancy of the velocity of light is incompatible with the equivalence hypothesis”. 1915: “the writer of these lines is of the opinion that the theory of relativity is still in need of generalization, in the sense that the principle of the constancy of the velocity of light is to be abandoned”. The last quote is the English translation of what Einstein said in German in 1916: “die Ausbreitungsge-schwindigkeit des Lichtes mit dem Orte variiert”. That translates to “the propagation speed of light with the place varies”. Einstein never did abandon his variable speed of light. The people who tell you that grew up before the Einstein digital papers were online. The general relativity they were taught wasn’t the same as Einstein’s. As to why, see Clifford M Will’s paper The Confrontation between General Relativity and Experiment. On page 4 he refers to a period of hibernation between 1920 and 1960, and a golden era between 1960 and 1980. On page 9 he says special relativity only became mainstream in the late 1920s. That sounds odd. Something else that sounds odd is something in the Wikipedia history of general relativity article. It says Kip Thorne “identifies the “golden age of general relativity” as the period roughly from 1960 to 1975 during which the study of general relativity, which had previously been regarded as something of a curiosity, entered the mainstream of theoretical physics”. So, special relativity wasn’t mainstream until circa 1930, and general relativity wasn’t mainstream until circa 1960. There’s more, because during this golden age, “many of the concepts and terms which continue to inspire the imagination of gravitation researchers and the general public were introduced”. All in all it would seem that something was changed, and something was lost. As for when I’m not sure. But Irwin Shapiro was talking about the variable speed of light in 1964. His paper was all about what we now call the Shapiro delay. Wikipedia faithfully quotes what Shapiro said, which is that “the speed of a light wave depends on the strength of the gravitational potential along its path”. That’s in line with Einstein and the evidence of optical clocks going slower when they’re lower. And yet when you google it, you find people saying “the Shapiro delay is caused by the distance between source and emitter being longer”. And you find people saying the unchanging speed of light in a vacuum is a foundational fact of relativity. There’s a huge contradiction between what Einstein said and what many physicists say today. So much so that general relativity today sometimes feels like an ersatz imitation of the real thing, authored by people who advocate time travel. However with a nudge from yours truly, the Wikipedia Variable Speed of Light article now talks about Einstein’s proposals after 1911. It says this: “there is no other way to interpret the velocity of light in this usage except as a variable scalar speed”. It also says “Peter Bergmann did not agree with Einstein, but left the dispute out of his earlier book in 1942 to get Einstein’s endorsement”. Peter Bergmann was Einstein’s research assistant in Princeton between 1936 and 1941. He wrote the first textbook on general relativity in 1942. But after Einstein died “Bergmann wrote a new book in 1968 claiming that vector light velocity could change direction but not speed. This has become a prevailing opinion in science”. I’m afraid to say that this prevailing opinion is wrong. It’s used to define the second as “the duration of 9,192,631,770 periods of the radiation corresponding to the transition between the two hyperfine levels of the ground state of the caesium 133 atom”. The radiation is microwave radiation, which is light in the wider sense. In essence you count light waves going by, and when you get to 9,192,631,770 you say a second has elapsed. Then you use the second along with the light to define the metre as “the length of the path travelled by light in vacuum during a time interval of 1⁄299,792,458th of a second”. You use the motion of light to define the second and the metre. And then you use them to measure the motion of light. That’s why you always measure the speed of light to be 299,792,458 m/s. It doesn’t matter how fast the light is moving, you will always end up saying the speed of light is 299,792,458 m/s. That’s the tautology. The speed of light is defined to be constant, and it is absolutely amazing that this is not generally recognised. Can you imagine what you’d think if somebody tried to tell you that the speed of racehorses was constant? And that the winning horse won because time flowed faster for it? You’d think they were crazy, or stupid, or both. But that’s what they tell you about optical clocks, and about light. The two light pulses aren’t going at the same speed. If they were, the parallel-mirror light clocks would stay in time. And if they did, the NIST optical clocks at different elevations would stay in time too. Only they don’t. See Is The Speed of Light Everywhere the Same? It’s a PhysicsFAQ article by Don Koks. He talks about laser gyroscopes and the Sagnac effect, and later says “Einstein talked about the speed of light changing in his new theory”. This new theory was of course general relativity, which concerns non-inertial reference frames. The article goes on to say the room you’re sitting in right now is a very high approximation to a non-inertial reference frame. And that whilst an observer stationed at the ceiling will measure the speed of light to be c, as will the observer stationed at the floor, the “global” observer will say that light at the ceiling travels faster than light at the floor. You aren’t situated at the ceiling, or at the floor. You’re sitting in your chair. You are that global observer. What this means, is that the speed of light varies in the room you’re in. If it didn’t, your pencil wouldn’t fall down. Pick up your pencil, hold it up at head height, then drop it on your desk. The speed at which it hits the desk depends on the difference between the speed of light at head height, and the speed of light at desktop height. The speed of light varies like the speed of other waves vary. Just like Einstein said. The situation is similar to sound waves in the sea, where the speed of sound typically decreases with depth. That’s why a horizontal sonar wave bends downwards. In similar vein the horizontal light wave bends downwards because the speed of light decreases with elevation. However the vertical sonar wave does not bend downwards, and nor does the vertical light wave. Imagine you had a torch that could emit a single photon. Imagine you aimed it straight up and pressed the button. What happens to the ascending photon? It isn’t like an ascending brick. The speed of light at the ceiling is greater than the speed of light at the floor. So the photon doesn’t slow down as it ascends. Au contraire, the ascending photon speeds up. This is, of course, a matter of some gravity. Before forming a logical conclusion on (constancy of) linear speed of light, it is essential to know what is light and its constituents? How does it move? and what is its moving mechanism? It moves like other transverse waves moves, Nainan, due to the properties of the thing it moves through. In a few weeks I shall post an article called What is a photon? It will show you the scientific evidence that tells you that the photon has an E=hf wave nature, but is neither a wave train nor a wave packet. Nor is it an electric wave and an orthogonal magnetic wave that generate one another. Instead it’s a singleton soliton electromagnetic wave with a “quantum” nature. Sorry John, I don’t have any tips. I’m new to this blogging game, I’m still finding my feet. I just set up the website on Godaddy then followed some instructions to allow “crawlers” to scan it, then logged onto Bing to tell them about the website. Can you give me a link to what you saw on Yahoo News? I couldn’t find anything there about it. Just a search result. (Search on Google and what comes up is the PSYCHIC detective, tsk). Thanks for the compliment by the way, much appreciated. The unchanging top speed through space in a vacuum, C, is a foundational principal of *Special* Relativity. General Relativity is based on a different principal: that acceleration and gravity are equivalent (crudely speaking). It is important to be clear which theory you’re discussing in this context. This is similar to the speed of light altering when it travels through, say, water. The reason for the “slow” down is not that photons are actually moving slower, but rather that they’re being absorbed and re-emitted by electrons. The Dirac equation tells you the physics. @Johnk274 – do not get your physics from this blog, because this blog says thinks like “the speed of light is not constant” which is misleading. Although beams of light might not have a constant rate of propagation through materials, that’s due to photons being absorbed and re-emitted. Photons themselves travel at C – which is measured to be constant, not a variable, to high precision. Let me say that again – the speed of photons is constant, as is the speed of all zero-mass particles. C.
Jim: I’ve given you Einstein saying the speed of light is not constant, plus Irwin Shapiro, plus Ned Wright, plus Joao Magueijo and John Moffat, plus Don Koks. I’ve also told you that a clock is not some cosmic gas meter with time flowing through it, so an optical clock doesn’t go slower when its lower because time goes slower when it’s lower. Now if you’re going to dismiss all that and cling to notions like gravitational lensing is caused by the absorption and re-emission of photons, and then tell people they shouldn’t get their physics from this blog, you and I are going to fall out. Follow my links, read the original material by Einstein etc, and do your own research and think for yourself. The speed of light constant in vacuum is an interesting combination of two ideas. One that the speed of light is constant and two, that there is a vacuum. There is definitely space. It is observable and obvious. The dark thing between the illuminated stuff in the sky is space. However, it is not nothing. Light goes through it, which makes it not empty. How much light goes through it? Enough to allow us to see everything visible and, presumably enough to make sure all the visible stuff stays where it is. There is a scary amount of idealism that passes for fact and masks the consideration of the real nature of things. Can there even exist a perfect vacuum devoid of light? If there is no perfect vacuum, then all of the light travelling through the near vacuum will interact locally with any other light it encounters. It will also interact with the effect of mass on space in the vicinity of the mass. Hence, gravitational lensing due to the effect of mass increasing the local energy density in its vicinity. I generally can’t find fault with the sentiments and factual direction of this blog. It chimes with both my gut feel and my interpretation of the facts of which I am aware. Thanks Andy. When you appreciate that Einstein, Shapiro, and many others have been saying the speed of light is not constant since 1907, it more than just chimes. It strikes you that the speed of light is constant is a myth, and yet physicists believe in it. So much so that they don’t know how gravity works, and think a gravitational field is curved space. Then when it comes to classical electromagnetism and quantum electrodynamics, they’re lost, with no concept of the underlying reality. Worse, they don’t know that they’re lost, and won’t look beyond the streetlight. Google on physics detective and what comes up is a whole pile of websites about psychic detectives. Do the same on Bing and it’s fine. The blog uses GoDaddy and their managed WordPress facility, and the OceanWP theme provided by “Nick”. It loads up quickly because the front page is a summary of posts, and just text with no heavy images. When you go into a post there are images but most are “below the crease” and not on the initial screen area. Hence that loads fast too. Thank you for sharing with us, this website truly stands out. The past couple of months I (i.e. someone who is acquainted with natural sciences only from an “outside-look”) was devoting way too much time searching for online articles to straightening out + clarify some of the things that just would not add up for me, within the [perceived] current status quo of nowadays astrophysics; too many arrogant students regurgitating what they read, copying the “understanding” of what they’ve been taught, to then talk down on any doubter (the illusion of education = intelligence/understanding); as if being born later automatically elevates them above historical misunderstandings, and thus could not be wrong, while anyone not tied into the mysteries they were inaugurated into, was automatically wrong, an imbecile, a .
I slept quite bad, thinking about the M.Morley-experiment and the crude “conclusions” drawn from it, which seemed more like a cheat (Lorentz-transformation) than the actual relative movements of corresponding particles (maybe the misunderstanding still solely lies with me); and even though this article is more concerned with general relativity rather than special, it did help; and restored some of the respect I had for Albert Einstein and his theories… “so it really was the detractors which now pose as his heirs… huh! – how history again and again tends to repeat itself when it comes to progress and the reception of great minds and ideas…”. Anyways; I often wondered: was there ever a scientific experiment to clarify, if polarized light bends differently, according to the polarization? that is to say: weaker for the light polarized transverse to the gravitational source, and weaker for the one being polarized vertically. — or in other words: do black holes polarize light, by bending some parts less so than others?!? My pleasure CG. I hope you find these articles useful. Yes, there are some arrogant people regurgitating what they’ve been taught without thinking for themselves. I think it’s rather sad, especially since Einstein had his “miracle year” when he was only 26. Sorry, I don’t know of any scientific experiment that demonstrates that polarized light bends differently. I haven’t heard of any scattering associated with gravitational lensing. Your English is just fine. And a whole lot better than my German! It’s not like I have heard about that effect, either; it’s just one of those interpretations that seem natural to me to assume — given some other assumptions… — as such i’d like to falsify or verify my suspicion (clarity is a nice thing to achieve), whatever it should turn out to be! PS: IQ usually is highest earlier on; it’s not entirely unusual, for any thinker, to come up with his/her best ideas in their late 20’s; even though they may only come to full fruition later on, when one has worked out all the flaws. Yes, there is much to be said. Once you’ve read some of the old papers I refer to here, and come to certain conclusions, I suspect you may be very very quiet for quite some time. For example, see what Schrödinger said on page 27 of his 1926 paper quantization as a problem of proper values, part II. About light rays influencing one another and showing remarkable curvature. The speed relative to the waves does vary, hiroji. That’s because the descending photon slows down. Optical clocks go slower when they’re lower because light goes slower when it’s lower. However you always measure the local speed of light to be the same because of the wave nature of matter. See The Other Meaning of Special Relativity by Robert Close: http://www.classicalmatter.org/ClassicalTheory/OtherRelativity.pdf. But then, if say I measure the speed of light at half the height of the room (which should be c0=299’792’458 m/s), and then observe a ray of light emitted at the top of the room towards the ceiling, I would deduce (using general relativity equations) that the speed of light is larger than c0 on top of me and slower beneath me ? David: yes, the speed of light is deemed to be locally constant. 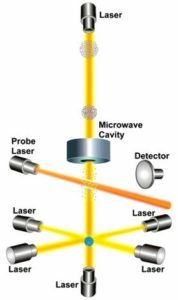 But that’s because when light goes slower, so does the observer, because all electromagnetic interactions go slower at the lower elevation. You have to be cautious about spacetime can be considered flat. Spacetime curvature is the second derivative of potential, and is associated with the tidal force. This is not detectable in the room you’re in. Spacetime can be flat and level, whereupon your pencil doesn’t fall down, or it can be flat and tilted, whereupon your pencil does fall down. See the next article where I talk more about this. Yes, you should deduce that the speed of light is larger than c0 above and slower below. Rather counter-intuitively, the ascending light beam speeds up. The descending light beam slows down. You say c = c₀(1 + Φ/c²), that is a typo error in Einstein’s paper, it should be: c = c₀(1 + Φ/ c₀²). Also according to Einstein lightspeed is not constant, and people citing him as saying it is constant, is just a translation error. Good stuff Roger, thanks. I’ll correct that and make a note pointing to your paper. As for people saying Einstein said the speed of light is constant, I think it’s more than just a translation error. I think it’s 1960s physicists doing their own thing and appealing to Einstein’s authority whilst flatly contradicting the guy. Einstein said the speed of light varies in a gravitational field. He said it time and time again, year after year, starting from 1907. And yet, what do I read? I read things like Einstein showed us that the speed of light was constant. Hi John, its a domino effect (i.e cumulative effect) where an initial mistake/error is made and more mistakes are then built on top. SRT is supposed to be his 1905 paper, and between 1905 and GRT in 1915 that is supposed to be him struggling with entwurf theory; the entwurf theory gets ignored i.e. the mindset of them is to ignore the 1907 quote you mention as not being SRT and not being GRT. Example of Einstein being mistranslated at: http://gsjournal.net/Science-Journals/Research%20Papers-Relativity%20Theory/Download/7671 in the part two : http://gsjournal.net/Science-Journals/Research%20Papers-Relativity%20Theory/Download/7676 it all boils down to one German word being mistranslated – the German which Einstein wrote as “nun” got mistranslated as the German “nur”. Resulting in the difference that (one way) lightspeed (in vacuum) can optionally be treated as constant, versus the usual belief that it is compulsory constant. Brawnian motion shown by many particles will be a model of the real world. And a measure of time and space will be invariable. Even when a light ray is passing by.